RECIFE: Niko Kovac says his Croatia side are facing their own World Cup 'final' against Mexico on Monday with only a win guaranteeing them a place in the last 16. Croatia bounced back from their opening 3-1 defeat to hosts Brazil in Group A with a 4-0 demolition of Cameroon last Wednesday to keep their knock-out dreams alive. Striker Mario Mandzukic scored two second-half goals as Croatia sent 10-man Cameroon crashing out of the tournament in disarray. Wolfsburg pair Ivica Olic and Ivan Perisic also got on the scoresheet, but Croatia still remain third in the table behind leaders Brazil and Mexico. Kovac knows his side face an uphill task against Miguel Herrera's side in Recife in the wake of Mexico's confidence-boosting draw with Brazil. Mexican goalkeeper Guillermo Ochoa wrote himself into World Cup folklore with a string of top-class saves including one from point-blank range to deny Brazil's Neymar in Fortaleza last Tuesday. A draw against Croatia would be enough to put Mexico through after their goalless draw with Brazil and 1-0 win over Cameroon. 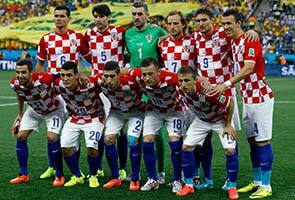 "The match against Mexico will be like a final," Kovac told Croatian broadcaster HTV. "Mexico are strong, but so are we. "The Mexico players are very patriotic, just like us, and they have a great team spirit. "They play some aggressive football with a lot of pressing. "They are strong going forward, but also have some weaknesses in defence, like Brazil showed us." Mexico have four points -- one more than Croatia -- as their draw with Brazil came after their 1-0 win over Cameroon thanks to Oribe Peralta's second-half winner. But the Mexicans are bidding to finish the group as winners and want to beat the Croatians to pile the pressure on Group A leaders Brazil. "We're in the group and battling it out for a place (in the next round) even with Brazil," said Herrera. "We've still got another group game to play and, like always, we'll be going all out for the win. "I told the lads that they did an excellent job (against Brazil), but we've still got to give everything to try and qualify."